The technology bridge from Hoi An to The Old Hospital Loch. Without a doubt the two human beings who influence my life the most today are Tim Berners-Lee and Steve Jobs. 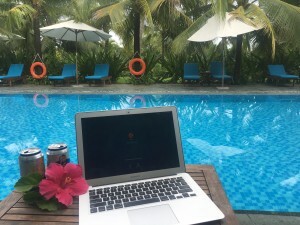 I have them to thank for the fact I can even contemplate writing a post for our website while holidaying in Vietnam, let alone being able to check bookings, reply to enquiries, mark off payments and send invoices. 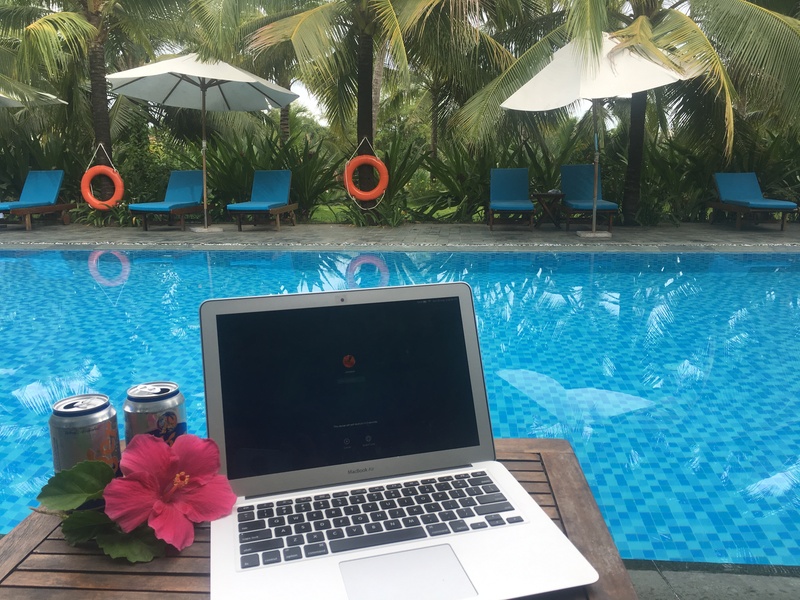 It may start to sound like not much of a holiday but all of this only takes an hour of the day and at 36 degrees with high humidity here in Hoi An, Vietnam, retiring to the air-conditioned room for a short break during the heat of the day is quite okay. Things are as easy here as hooking into WiFi wherever we go – airports, our hotel, cafes, bars and even the most basic of street food restaurants and mini marts. Asia is so tech savvy, although connectivity can sometimes require the patience of a Buddhist monk. Over the many years of our travels through Southeast Asia, we have stayed in some pretty remote areas. Most houses in these villages are very basic little huts, where three or four generations eat, sleep and socialise together in the same room. But there on the roof is a massive satellite dish, inside is a big flat screen TV, the whole family are on the internet (even grandma), and everybody has a mobile phone. Almost 10 years ago we spent a couple of nights out in the middle of Halong Bay on a “junk” boat with two teenage daughters. Our eldest was happily texting her boyfriend from way out yonder on the water – thank goodness she had connection or we may have had to live with the consequences if she could not reach him. Another time we were on a catamaran in rough seas on the Lombok Straight and as the waves washed over the bow and inside the boat, the said daughter was texting the said boyfriend again, telling him she was drowning – to be fair to her she probably panicked a bit when they played the theme from Titanic over the loudspeaker! We have been lucky enough to escape the winter for a couple of weeks and leave the running of The Old Hospital with good friends. It has been an interesting mix of emotions leaving the guest house in the hands of someone else – (a bit like handing your baby to a babysitter for the first time), with the added thought they may just do a better job than us! As we arrived at the airport (and checked our e-mails, Instagram, Facebook pages and What’s App’d the kids), we put our concerns behind us and were suddenly excited to be going on holidays. We knew that in the unlikely event our trusty relieving managers encountered a problem, we were only a mobile call, text, email or What’s App or Skype message away! Thanks be to Tim and Steve. Preparations are well underway for an evening with Melba Opera Trust next weekend in Loch. Saturday 18th at the Loch town hall is building to be a gala evening. The village is frocking up for the black tie evening and with supper provided and drinks at bar prices no one will go wanting. Dame Nellie Melba GBE (1861 – 1931) was Australia’s first world famous opera singer and one of the greatest celebrities of her day. Born in Richmond, Melbourne she moved to Paris and went on to enjoy an enormously successful career as a prima donna in Australia, England, Europe and the United States during the 20th century. When she died, Melba bequeathed a generous amount of money dedicated to the development of young opera singers “so that another Melba may arise”. This unique and direct legacy from Melba is strengthened by the continued patronage of her late granddaughter Pamela, Lady Vestey which continues today through Melba’s great-great granddaughter, The Hon. Saffron Foster. 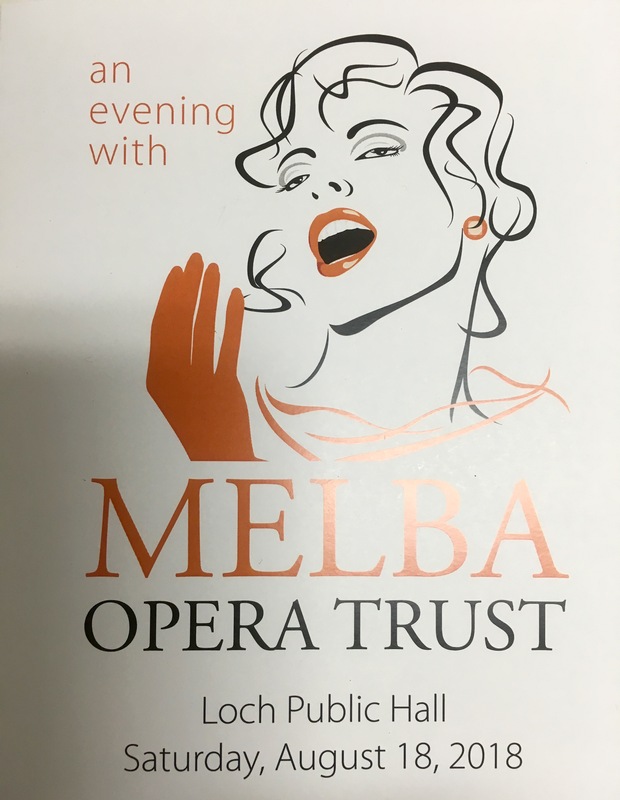 Melba’s gift established the Dame Nellie Melba Scholarship, which still exists today with Melba Opera Trust. Tickets are still available at trybooking.com/399746 so if you feel like a fun, formal evening out, we’ll see you at the opera. Picture postcard views await at The Old Hospital Loch. 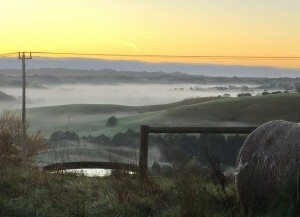 A drive through the pretty hills around Loch Village in South Gippsland is rewarding not only for its picture postcard views but also the many gourmet delights on offer. Guests staying at The Old Hospital have a plethora of options supplied by their hosts Peter and Michelle Campbell. One option may take in the back road from Loch to Poowong and onto a single lane bitumen road winding its way through the Bass Valley where a wallaby or two can be seen. Onwards through the hills towards Jumbunna, dropping in to Prom Country Cheese for a morning tea platter. On a Sunday you can catch the Kongwak market and its quirky retro goods, food and fine coffee. From there a quiet country road leads on through the hills to the Kernot Store for a late lunch of delicious wood fired pizza. A short drive back towards Loch, popping in to the Gippsland Wine Company and Loch Brewery & Distillery for refreshments. At the end of the day guests can relax, enjoying the comfortable facilities with friends while self catering or choosing to indulge with a fully catered package. And this is just one day at The Old Hospital Loch! But there is no sound of music. 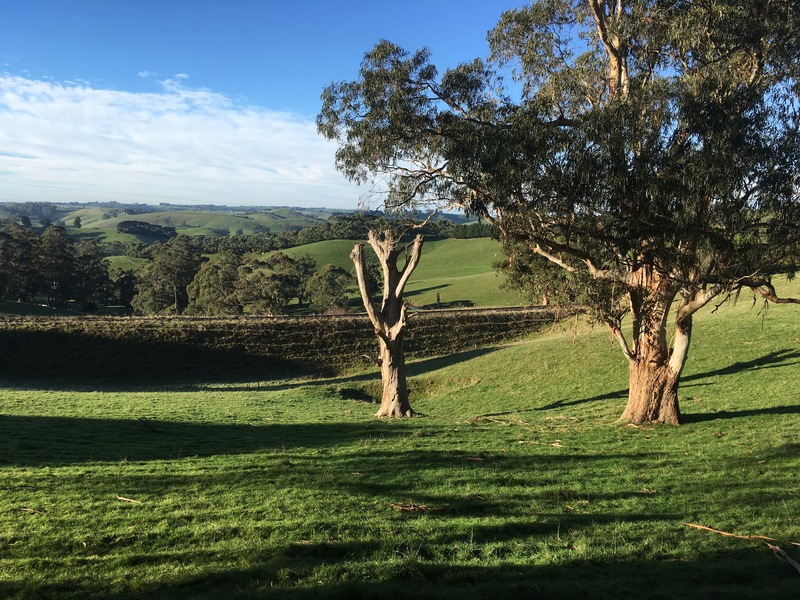 Just the peace and tranquility of NOTHING AT ALL – only the occasional sound of kookaburras and other birds, happy as we are to be living in South Gippsland. Eighteen months ago, we decided it was time for a tree change. We had sold a business in the city, travelled far and wide, and generally took time out to smell the roses. All we could smell was gum trees. The opportunity arose to create a life for ourselves in the country. So we took the bull by the horns, bought an old hospital, moved to Loch Village and the rest is history. When all things “renovating” (i.e converting the building and dealing with all the permits required), overwhelmed and consumed us, we would take the afternoon off and head off to explore the surrounding hills. As we came upon a beautiful spot somewhere in the South Gippsland back roads, we would turn off the car’s engine and just sit and listen – to nothing, or maybe the distant moo of the odd cow. We were happy to get lost driving those endless remote roads of peace and tranquility. We reminded ourselves that this is why we made our tree change. Even in our little village, the few cars, motorbikes, tractors, and cattle trucks that we do get passing through from time to time, all disappear upon dusk. 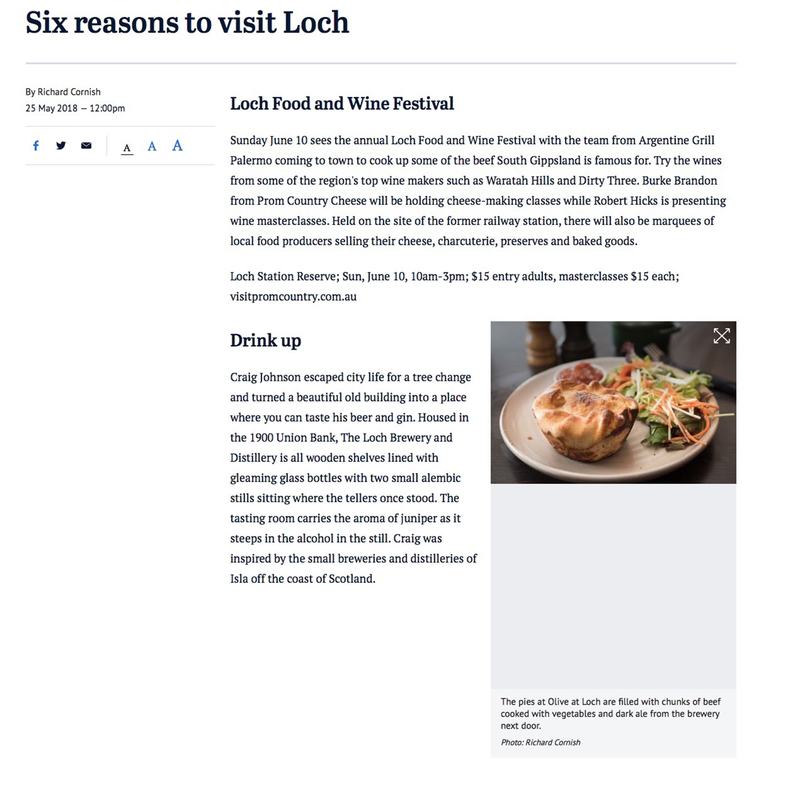 Most times in Loch village “peak hour” means not one car to be seen in the main street – and that is what we love about the place! Nothing at all. 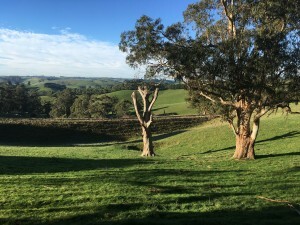 Sure, we head off to the city to visit friends and family, go to appointments and do the necessary shopping run, but when we turn off onto the South Gippsland Highway and look towards Nyora across the paddocks with dams and beautiful forests of gum trees, we breathe a sigh of relief – we relax and we are almost home. Home to nothing at all. The first 6 reasons were recently published in The Sydney Morning Herald. The 7th reason is that there is great accommodation for groups of up to 18 at The Old Hospital in Loch. We have had a stellar start up to our first year of guests choosing to stay with us. We have now taken bookings up until May 2019 – mostly from guests who rebook before they leave us. Our very first booking was taken way back in September 2017, when several of the group members came to visit us. We were in full throes of renovation, so the place was not looking it’s best. The group of wonderful ladies could share our vision and enthusiasm and finally came to stay with us a few weeks ago. They were delighted with the end results – thank you Rhonda and friends for your support. In the summer months the entire building is cooled by fans and air conditioners. In the depths of winter our accommodation is warm and cosy, heated by a wonderfull hydronic system and backed up by reverse cycle split systems. Some guests have chosen to self cater, but many have taken up the option of our catering service provided by Not Just Tarts. The food is gourmet standard and the choices are endless. The cost of our catering compares with less than the cost of a pub meal and is extremely good value. They are happy to offer full catering, where guests are waited on and don’t have to worry about the clean up. Alternatively, they now offer a “Heat & Serve” option, where food is freshly prepared on our premises prior to guests arrival and is left in the fridge with full instructions for guests to reheat when they are hungry. Our guests wander down to the cafes and shops in the town several times during their stay with us. This benefits our local traders and encourages others to visit and stay awhile. The Old Hospital offers free wifi throughout our large building, which guests have the exclusive use of. Is this how you want to be remembered? Do you want to escape all the hype of the Grand Final weekend? Are you going to be deserted by your partner? Would you prefer peace and tranquility? The Old Hospital together with Not Just Tarts, is offering a special “Footy Avoidance” weekend for those wanting to escape it all on the AFL Grand Final Weekend. We are offering a Gourmet Getaway Package, so you can escape, relax and ponder your non-footy thoughts with a few fellow escapees and a glass of wine. You will enjoy two nights of warm and comfortable en suite accommodation at The Old Hospital, which your group will have exclusive use of. Our fabulous catering team at Not Just Tarts will supply an extensive menu for your groups selection. Your gourmet choices will consist of 2 breakfasts, 1 lunch and 2 dinners, with complimentary desserts and sides. These will be freshly prepared for you just prior to your arrival and ready with full “Heat and Serve” instructions. We are pleased to offer this great value all inclusive price of $249 per person (twin share). If you wish to have a room to yourself, please add an extra $44 per person. This offer is only available to one group of 6 to 18 adults (18 years and over) for the 28th to 30th September 2018. Contact us on 9597 0137 to book your “Footy Avoidance” weekend. P.S We do have a TV if you want to check the footy scores! Ab Fab Reviews at The Old Hospital, Loch. Guests at The Old Hospital have been leaving some lovely Reviews, such as this recent one on TripAdvisor. “Our group of 9 girls were delighted to have our own rooms, each with ensuite bathroom, and the beds were extremely comfortable. Showers and heating were also great. Sleeping areas are in a separate wing – so no chance of being disturbed by others. Lots of lovely spaces: including sun lounge, BBQ area, large deck, large sitting and dining area. Extroadinarily well-equipped kitchen, with everything you could possibly need and lots of extras supplied, such as kitchen towel, cling wrap, sugar, tea etc. We even found a wide variety of cheese knives/cutters for our cheese platters. Thanks Anne and your book group friends. Last month saw the arrival of Royalty at The Old Hospital. The “Regal Rubies” bestowed a visit upon us for the weekend. 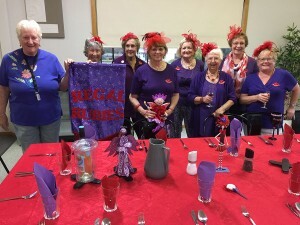 This group of energetic ladies are a division of the Red Hats – a ladies social group that has world wide affiliation and has gathered enormous momentum across the globe. The “Rubies” were gems to host and dazzled us with their energy and enthusiasm for just having a good time. Each day they were off visiting local gardens, friends in the area and food & wine producers for a taste of what South Gippsland has to offer. The Rubies were fit and active ladies of middle age and beyond – the most senior member of the Rubies was a tap dancing nonagenarian – just as elegant as Queen Elizabeth herself, but with a lot more fun and laughs than would be found beyond the walls at Windsor Castle. In keeping with Royal protocol, they had invited four VIP guests to dine with them on the Saturday evening. The lucky VIP guests were two locals who were friends of the Rubies, and Peter and Michelle, the Rubies fortunate hosts for the weekend. All guests were wined and dined on beautifully Royally red tablecloths, fine bone china, silver cutlery, and crystal glassware.Actually, I embellished that bit – we had red nylon tablecloths, everyday china, cutlery and glassware was the order of the evening, but we felt very special. Our brains were then put to the test with a cryptic quiz – Michelle scored top points and won the major prize of two mini Easter eggs and the glory of being the first place winner. We had the most enjoyable evening being invited as the groups guests, and served a delicious meal, in our own surrounds. Thanks to the Regal Rubies for delightful company – we will be rolling out the red carpet for their next visit! The Old Hospital has just opened the booking calendar for 2019 and bookings are starting to come in so if your group is thinking of a getaway in 2019 please book early to avoid disappointment. 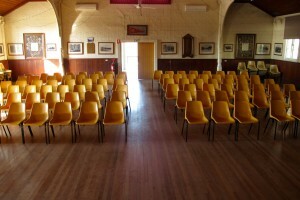 Great space, perfect for our corporate retreat. “Great space, perfect for our needs. We ran our not-for-profit leadership retreat at The Old Hospital over 3 days/2 nights with 18 attendees. From our first contact to leaving on the last day, Peter was incredibly accommodating, easy to work with, and quick to respond to our many questions and changes in our requirements. The space itself was fantastic for our needs. Our 3 days were packed with activities, and having multiple spaces to use helped break up the day and allow for multiple sessions to run comfortably at the same time (the garden and deck particularly were wonderful for our meet and greets and to get us energised in the mornings). We were so impressed with the catering who responded to all our dietary requirements (something which can be hard with a big group! ), and when we cooked our own meals, the kitchen was well equipped, although some labels on cupboards would be a good addition! The leftovers from the hospital like the call buttons were a nice touch, and it was fun to stay somewhere with a bit of character. 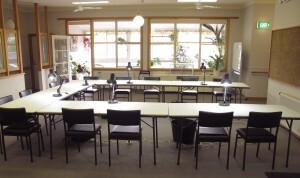 Our first corporate group were able to to utilise the many features The Old Hospital has to offer, such as the quiet garden setting for some meditation time, the break out spaces for one on one meetings and the large dining room where they enjoyed some excellent meals provided by our caterers. The Old Hospital is pleased to have secured the services of our exclusive in house catering team, “Not Just Tarts”. They have many combined years of food industry experience and produce high quality, delicious cuisine at extremely reasonable prices. They are able to cater for dietary requirements, including vegetarian and vegan dishes. The conference room comfortably accommodated the group of 18 and our facilities were well utilised – our projector and screen, whiteboard and large pin board for showcasing ideas were beneficial for their group activities. Our inviting ensuite bedrooms provided respite from the “work” areas. At the end of the day, the participants could take a little time out from work, unwind with a hot shower and relax on our inviting plush top mattresses and allergy free quilts, before joining the rest of the group on the deck for evening drinks before dinner. The 2018 calendar is filling up rapidly, so please visit our online booking partner to make a booking. We have had strong interest from the crafting community, who are enjoying all The Old Hospital (TOH) has to offer for their craft retreats. When we first embarked on our renovation project, we anticipated the most interest from the cycling community. It wasn’t until a colleague mentioned that she was a quilter and loved heading off on a craft “retreat” for a few days, that we realised TOH was the ideal place for these groups to gather, relax and allow their creativity to run wild. Our 8.5m x 6.5m activities room was calling out to us to welcome these groups. We asked the craft community what equipment they liked to have ready for their arrival. Even though a lot of crafters are mostly self sufficient, we wanted to offer a few gadgets to lighten their load when packing the car to head away. 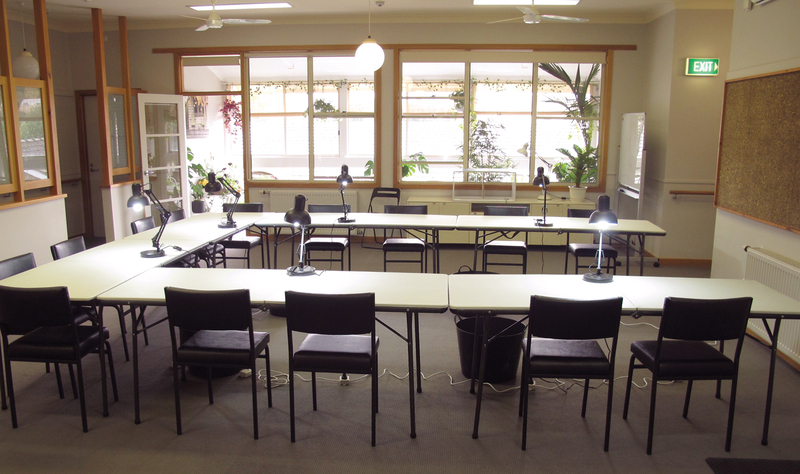 Comfortable chairs, lamps, ample light and lots of power outlets and power boards were top priority. We bought chairs with well padded backs and seats, as our crafters spend a lot of time sitting at their sewing machines. We even bought a couple of lumbar supports for those with a “niggle” here and there. Our adjustable lamps have heavy bases for safety and daylight globes to make their projects a little brighter at anytime of the day (our last craft group were sewing away late at night). We had 11 sewing machines whirring away, lamps all ablaze, 2 irons pressing projects all at once and our commercial electrical switchboard was not fazed. Having once, twice, three times been a busy commercial hub, TOH’s power supply rises to the challenge of coping with whatever we throw at it. Our onsite managers test& tag all the electrical appliances, giving our crafters peace of mind that all is safe when the demand for power is increased. Our 4 big scrap bins soon filled with the unwanted remains of our crafters masterpieces. Our new, well lit cutting table & mat was placed looking into our glorious sunroom and across the surrounding hills of Loch. Our crafters were pleased to abandon their creations temporarily and leave everything set up, so they could gather for a drink on the deck and share a meal in our dining area, which is connected to the kitchen by a big servery window. Even the designated cooks could join in the conversation. It was lovely to hear them happily chatting & laughing – clearly they were enjoying themselves! We know this because they have booked to return in November. We loved having the ladies, with their great sense of humour, stay at TOH and look forward to seeing them again. Thank you to Heather and friends…. Originally a country hospital, it is now a refurbished guest house. The Old Hospital is an ideal retreat for community and interest-based groups as well as corporate groups.